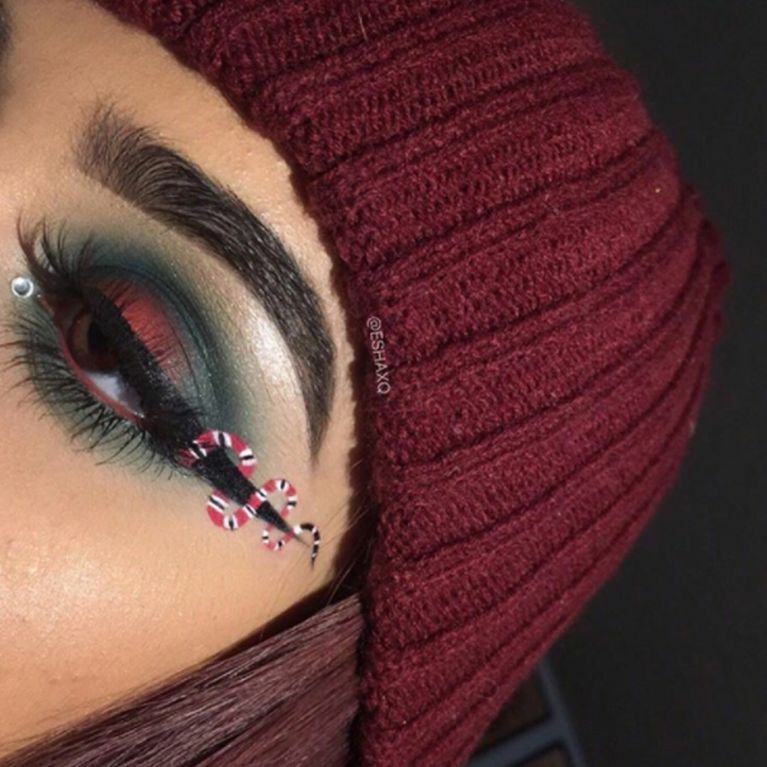 2017 has spawned all variety of weird, wonderful and NSFW trends but this beauty blogger's reinvention of the infamously impossible-to-perfect eyeliner flicks may just be the most timely of them all. Essa Javed has created snake eyeliner just as head serpent herself Taylor Swift dropped new music and we're 100 per cent here for it. Beauty bloggers are forever coming up with new ways to change the game but if you're yet to master the art of eyeliner flicks, you might want to sit this one out. Self-taught make-up artist Essa Javed is one step ahead of the game with her hilariously-appropriate snake eyeliner which she unveiled to the world of Instagram just as Taylor snake Swift dropped new music. But the superstar - who's feuding with anyone and everyone who's worth feuding with right now - wasn't the inspiration behind the look that's slithered onto our Instagram feeds recently. In fact, Essa chose to replicate Gucci's famous snake motif on her eyes because this is 2017 and this is where we're at, people. The Chicago-based beauty blogger revealed the products she used in the caption, naming @anastasiabeverlyhills eyebrow definer in Dark Brown, @morphebrushes 35B palette, @nyxcosmetics Vivid Liners (Red,White), @wetnwild h20 waterproof liquid liner, @dodolashes in D315 and @tartecosmetics shape tape concealer. Although Essa is yet to release a video how-to tutorial of the look, other experimental Instagrammers have tried to re-create it. Considering I smudge every smidgen of liner I apply, I think this one's best left to the experts.